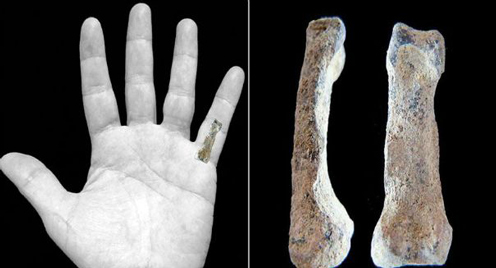 A tiny finger bone, representing the proximal phalanx of the fifth digit of a hominin’s left hand has led scientists to reconsider the date of our ancestor’s descent from the trees. Put simply, the discovery of one of the world’s oldest little finger bones from a human-like species suggests that at around 1.8 million years ago hands had already become much more readily adapted to using tools than to climbing trees. The finger bone, is not curved, curved bones in the digits are indicative of a grasping, weight bearing role very typical of apes that live in trees. The bone is very similar in shape to that of a modern human little finger bone (Homo sapiens). Various Views of the ancient hominin finger bone. The bone was discovered in the Olduvai Gorge region of Tanzania and it is estimated to be about 1.8 million years old. The fossil find suggests that by 1.8 million years ago, a human-like species had already made the transition to terrestrial living whilst co-existing with more arboreal hominins such as Homo habilis and a member of a distantly related sub-branch to the hominin family tree that led to modern humans Paranthropus boisei. According to researchers such as Manuel Domínguez-Rodrigo (co-director of the Olduvai Gorge-based project The Institute of Evolution in Africa), this discovery pushes back the origin of dextrous human digits some 400,000 years. The location of the bone in the left hand. The scientist, who has been involved in research projects in Tanzania since 2006 explained that this was evidence supporting a significant change in the behaviour of our ancient ancestors. If the hands were no longer being used to climb trees, then they could be being used for other purposes such as making tools. Although the finger bone is a different shape from the bones of contemporary Australopithecines, other scientists, such as Richard Potts of the Smithsonian Human Origins Programme (Washington D.C.) has suggested that a single bone is not enough evidence to conclude that the hand it came from truly resembles that of a modern human ancestor.